Dr. Cecil George was a marriage counselor and psychoanalyst and the co-founder of ALPCA. About 1952 he bought some property in North Attleboro, Massachusetts, which included a barn with many old plates still tacked on the wall. This provided the beginning of his collection. In August of 1954 he read a story in the Boston Post about a New Hampshire postmaster who collected license plates. That of course was Asa Colby. He wrote to him suggesting they might swap some of their duplicate plates and the seeds of an organization were sown. In October of 1954 the historical "George Letter" was mailed to every name that could be found in hobby newsletters, stamp and coin journals and antique car publications. There were fifteen immediate responses. The first organizational meeting took place December 2, 1954. This established Dr. George as the first president and holder of ALPCA membership # 1. 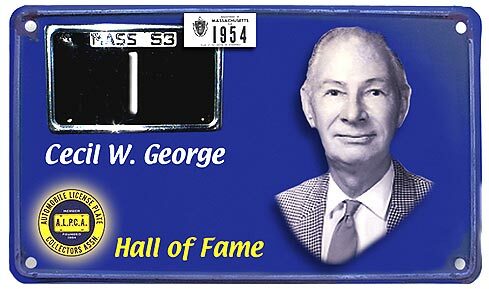 The first ever "official" license plate meet was held at his Massachusetts home June 18th and 19th of 1955. The second "official" meet was also held there. Dr. George retired to Florida where he passed away in 1993. His first newsletter was a how to and who's who of license plate collecting. He never had a big collection but that is atypical of ALPCA. It is and has never been about how big or how great one's collection is; it is about the fellowship and the challenge. Dr. George's humanity was topped only by his charity and organizational skills. His "George Letter" identified the plight of a fellow collector in Europe who was down on his luck. Dr. George solicited aid and assistance for this collector without his knowledge so as not to embarrass him and with no personal gain to himself. This is the legacy of a truly generous gentleman who established the pinnacle all collectors should strive to attain. It is only fitting and proper that Dr. Cecil W. George is established as the first member of the ALPCA Hall of Fame.